We only charge $48~$55 per person-hour for ALL the following listed services. charges $55/hr, all clients get 25% more minutes during October- the Grand Opening Month. Please call 212-586-8899 to book. Best massages in the NYC with unbeatable price! One of the best Taiji Body Work treatment at the unbeatable price in the City! Include neck, back, legs, foot reflexology -- full body massage. 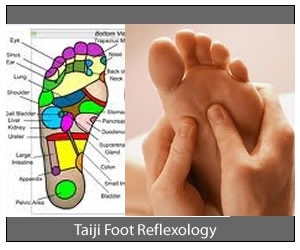 Reflexology is based on the principle that there are reflexes in the hands and feet that relate to every organ, gland, and system of the body. We offer reflexology and a massage that will concentrate on relieving pain from your calves, ankles, shins and feet. This treatment is perfect for the worn out workaholic. This treatment focuses on the neck, shoulders, upper back and hands using acupressure points to relieve inflammation in the joins and muscles. Enjoy some quality relaxation time with your loved one. 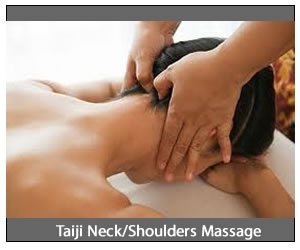 Both of you will feel refreshed and rejuvenated while experiencing one of Taiji's award winning massages.